Some our favorite female artists and bands from the twentieth century. Last semester, I took my first trip to the National Museum of Women in the Arts in D.C. to visit the "Women Who Rock" exhibit that was running at the museum. While it was interesting to check out the outfits on display of recent pop artists such as Taylor Swift and Lady Gaga (the infamous meat dress was part of the installation), the best part of the exhibit was the exposure it gave to female artists who aren't as well known to our generation. 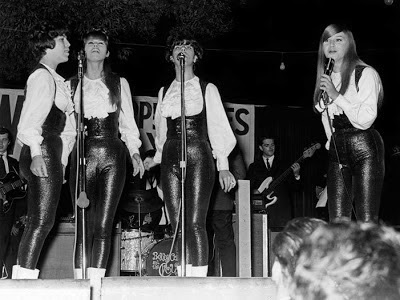 For example, I had always known about The Shangri-Las but finally got a chance to learn a little bit more about them. I got a chance to see artifacts such as the lunchbox that Lesley Gore took on tour and a dress that was once donned by the Supremes. Attending the exhibit gave me the chance to learn more about the history of women in music than I had in any other singular place. It also inspired me to go on a serious oldies kick. This mix obviously doesn't cover the wide range of female artists in the 1900s, but these are some of the ones that I have been listening to constantly since I visited the exhibit until now. Most of these artists and groups are from around the fifties and sixties, such as Wanda Jackson and The Ronettes. These have been my favorite discoveries of late since their influence is so prevalent in the music we listen to today. There are some exceptions, such as The Pandoras and the Trashwomen who are from the eighties and nineties respectively. But both bands sounds take on a sound that make them sound like they're straight out of sixties and are made of groups of badass ladies, so I thought they deserved a mention. I would speak more about these artists, but I currently have the flu so writing is a little difficult. But make sure to listen to the whole mix – Connie Francis' version of "You Only Hurt the One You Love" might be the last track, but it's certainly one of the best. Ladies of the Past from thelesigh on 8tracks Radio.